Paradise Ponta Beach House in Ponta Malongane is an up-market private home, located in the Vista Alta Estate - close to the 360° Restaurant. 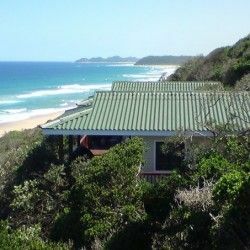 Nestled in a coastal dune forest with walkway access to the beach, accommodation at the Paradise Ponta Beach House is provided in a stylishly decorated, fully furnished and equipped 4 bedroom house for a maximum of 10 people (including a child). The bedrooms are furnished with a queen-sized bed in the first room, a double bed in the second room, three single beds in the third room with an additional single pull-out bed underneath (that can be used in the second or fourth rooms) and a queen-sized bed in the fourth room. All bedrooms have bathrooms en-suite (with double showers in each) and all linen is provided except beach towels. There is a lounge area with TV and DVD player (guests required to bring own decoder, smart card and remote for DSTV), fully equipped kitchen - the water is filtered with an ice-dispenser in the fridge. All rooms have fans and the coastal Milkwood forest outside to keep the house cool. 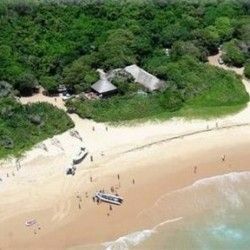 You will find a firestone boma on the sand in front of the house for bonfires or braai’s and a large selection of hammocks on the deck to laze in as well as a spa pool and outside shower to cool off in. At Paradise Ponta Beach House you can enjoy all the comforts of home whilst over-looking the dolphins and whales in the beautiful Ponta bay. It truly is …Paradise! R2 500.00 for a maximum of 4 people plus R250.00 per additional person per day (maximum 10 people). A 4x4 vehicle will be required from the border to get to the estate. If you do not have a 4x4, there is safe parking at the border on the SA side (for approx. R30 a day) and you can make prior arrangements for transfers to the estate in Mozambique. We had the time of our lives and the kids said it was their best holiday ever. Thank you so much for everything, the accommodation at Paradise was amazing, clean, organised and well looked after. The staff were really friendly and so helpful please thank them again from us all and Angie from the Dolphin centre was truly amazing and what an incredible experience we had. As always it was a wonderful stay, we do love the house and its location. The addition of the chest freezer is a bonus. Edna was wonderful in servicing the house, always a happy smile and hard working. I just want to say a VERY big thank you for recommending Ponta Beach House! We had the best holiday! Overall this was one of the best holidays we’ve had a in a long time. The only thing we struggled with was hot water for 8 people. But not a train smash as it was warm weather. And we took turns to shower morning and evening. Just a quick note to say we had the most amazing holiday at Paradise, the house is amazing and gave us the perfect space to recharge our batteries. We will definitely be back.